Smart door closing application suitable for glass, wooden, aluminum and steel doors. Double acting, narrow style and easy installation. Suitable for the doors up to 100kgs (220lbs) weight. The NHN PDC100 patch fitting pivot door closer is the first in the Flagship Range from NHN’s next generation of hidden door closers. Incorporating the latest cam type technology, the NHN PDC100 patch fitting pivot door closer offers easy opening with increased efficiency on the closing torque. 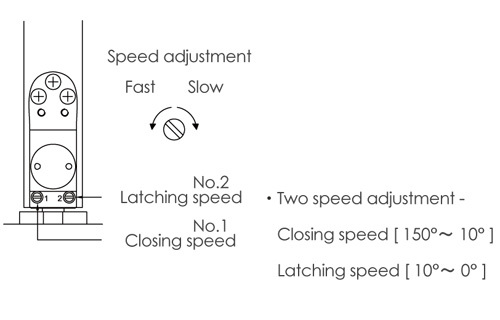 + The closing speed is easily adjusted via two independent adjustment valves. + Available with or without hold open at 90°. + Narrow style with high performance. + Easy installation; cost and time saving as no preparation on the floor needed. + 5 year Guarantee against faulty workmanship. PDC100(S): Suitable for a glass door 8-13mm (5/16 – 1/2 in.) thick, 750-1000mm (29 1⁄2 – 39 3/8 in.) wide and a maximum weight of 100 kg (220 lbs). PDC105(S): Suitable for a glass door 10-15mm (3/8 – 9/16 in.) thick, 750-1250mm (29 1⁄2 – 49 3/16 in.) wide and a maximum weight of 100 kg (220 lbs). Supplied non handed the NHN PDC100 provides optimum efficiency with quick and easy installation. Simple final adjustments; 3mm (1/8 in.) backward/ forward, 3mm (1/8 in.) left/right, ± 4° alignment. Ambient temperature from -20°C to +50°C (-4°F to +122°F). It is recommended to use a door stop at 150° by the non-hold open models and at 90° by the hold open models. Can only be installed on interior doors, not suitable for exterior doors or doors exposed to strong winds. 1. 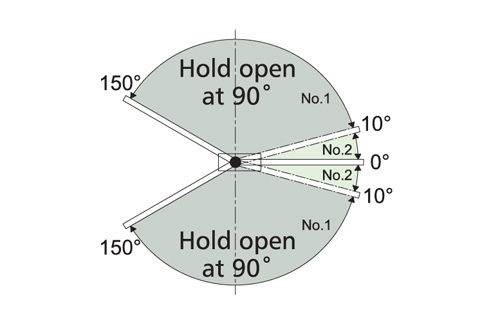 Double action -Non hold open model PDC100: Maximum opening angle 150° -Hold open model PDC100-S: Hold open position angle 90°, maximum opening angle 150°. 3. Providing over 70% efficiency, the NHN PDC100 combines light opening with smooth closing. The NHN PDC100W concealed/hidden pivot door closers are suitable for wooden, aluminum and steel doors. Incorporating the latest cam type technology, the NHN PDC100W concealed/hidden pivot door closers offer easy opening with increased efficiency on the closing torque. Suitable for double action doors, maximum 1250mm (49 1/2 in.) wide and a maximum weight of 100 kg (220lbs). Simple final adjustments, 3mm (1/8 in.) backward/ forward, 3mm (1/8 in.) left/right, ± 4° alignment. 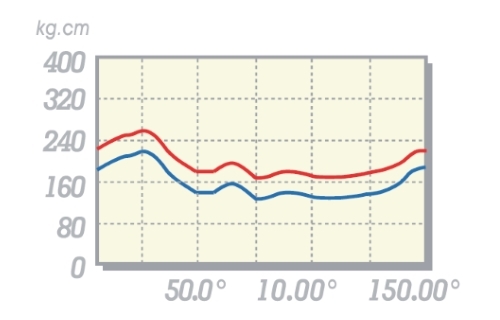 Ambient temperature from -20°C to +40°C (-4°F to +104°F). 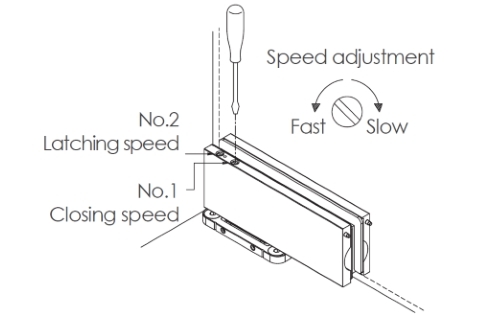 It is recommended to use a door stop at 150° by the non-hold open models and at 90° by the hold open models. 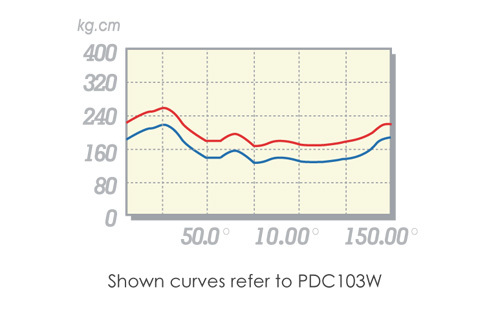 Model PDC-103W (S) can only be installed on interior doors, not suitable for exterior doors or doors exposed to strong winds. Even for PDC-105W (S) models please note that due to the cam type technology heavy winds might cause opening of the door to a certain angle. 1. Double action -Non hold open model PDC103W,105W: Maximum opening angle 150° -Hold open model PDC103WS,105WS: Hold open position angle 90°, maximum opening angle 150°. 3. Providing over 70% efficiency, the NHN PDC100W combines light opening with smooth closing.